As language teachers, we always strive to encourage our students to use language in as “authentic” a way as possible, but we are constantly faced with the limitations of a classroom setting with all its attendant “artificiality”. This is one reason why I believe learners have so much to gain from engaging with the language and culture they are studying in other ways, outside the classroom and away from the dynamics of a student-teacher relationship. Both as a language learner and as a teacher, I have found language tandems to be a great means of accomplishing this. This is why I am especially pleased to have joined three other Blanquerna faculty members (Dr. Lidia Montero, Dr. Caterina Riba and Helen Ruiz), all of us also members of Blanquerna’s Research Group CILCEAL (Interlinguistic and Intercultural Competence in Language Teaching and Learning) , in working on the EUniTa (European University Tandem) project. The aim of this EU-funded Erasmus + project is to create a platform that will make possible online exchanges among speakers of different languages. The platform’s users will soon be able to connect via online video chat with students and faculty from the six other participating universities, located in Germany, France, the UK and Italy. Users will be able to collaborate with fellow students or colleagues from other universities, helping one another in the language learning process and forging connections. The platform could later expand to include other universities, and it will be a valuable model for other schools and educational institutions who want to give their students the chance to benefit from online tandems. Here, I would like to include a few words about language tandems in general. In a tandem context, each partner acts both as a learner of the foreign language and as a tutor of (what is usually) his or her mother tongue. Although they are not quite “normal” social situations, tandems do represent an opportunity for learners to truly use the language they are studying in an authentic social context, one in which they will be forced to meet real communication needs that are bound to arise. My own experience as a tandem participant as an American study abroad student in Spain was more than enough to convince me that the need to bridge these real communication gaps can be a great source of motivation. The reciprocal nature of the relationship involved in a language tandem is another element that appealed to me as a student, and I think it fits nicely with some of our evolving goals as 21st century educators, especially when it comes to intercultural competency. The two partners, and the two languages, enter on equal footing, and a tandem is by its very nature a joint undertaking with someone from another culture, one that calls for negotiation and collaboration. This is why I believe that as much as a language learning tool, the EUniTa platform is a means of intercultural exchange. Among the chief research lines of the CILCEAL research group is “additional language learning in an intercultural and plurilingual context as a factor of social integration”. The chance to help shape such a learning context for students around Europe is an exciting one. 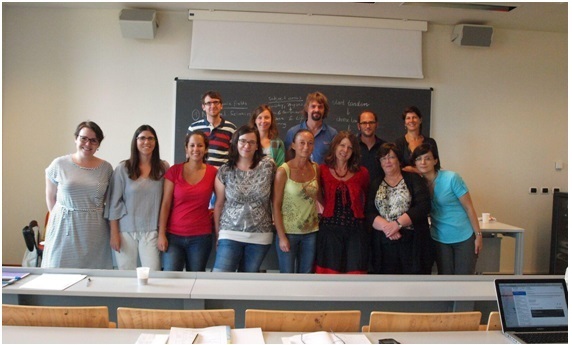 Equally exciting has been the process of working with language learning experts from around Europe. It is true that as an experienced language teacher I have been able to bring to bear on the project my classroom experience and my knowledge of how to get students talking and engaged, and how to incorporate authentic online materials as part of the learning process. However, I think I can speak for my research group colleagues to say that we are benefitting greatly from the experience of working on this team of professionals, some of whom are responsible for overseeing tandem programmes for hundreds of students and coordinating foreign language programmes for large universities. I like to imagine that the when the platform is launched, it will spur users to embrace the very same spirit of international exchange that has driven us in its design. It often happens that language learners who may be interested in having a regular tandem partner are unable to find anyone locally for an in-person exchange. The EUniTa team were far from the first to note this problem, and several existing (and some now defunct) services have tried to cater to this latent demand by providing online exchanges. This new platform, however, aims to stand apart in a few ways. Firstly, it will feature a range of content designed to stimulate exchanges and fuel language learning, and it will include activities aimed at prompting users to practice not only everyday language (Basic Interpersonal Communication Skills- BICS), but also academic and professional communication (Cognitive Academic Language Proficiency- CALP). We hope that the breadth, quality, contemporary relevance and academic interest of the activities we are creating will go beyond what was offered by prior platforms. Secondly, it will use a customised algorithm to match each participant with the best possible tandem partner, based on interests, language level, time commitments and other factors. The experience and data we gather as the platform takes shape are sure to give us new insights, both into what makes an effective language tandem and more broadly into the fields of language learning and intercultural communication.